Please feel free to email me any questions that you have. Most international schools hire between the beginning of Jan to early March. They will hire up until August, but the jobs get fewer and far between. The best thing to do is to email any school you are interested in as you never know. Just note that many will not respond or send you any indication of your email making it to them, this is relatively normal. Normally you would begin to email and contact schools for the upcoming school year at the beginning of October of the year before! Things start early! I have used the Northern Iowa job fair, and twice been to the COIS job fair in London and the Search Associates fair in London. I have gotten jobs at both. Iowa is very Asia, Middle East and South American. COIS is more Europe, Africa, Asia. There are also International School Services and Search Associates, I most recently used Search and the London job fair to get the job I am in now. Search’s database is fantastic. The main job fairs are in January or beginning of February. The first is the first weekend in January in Bangkok. 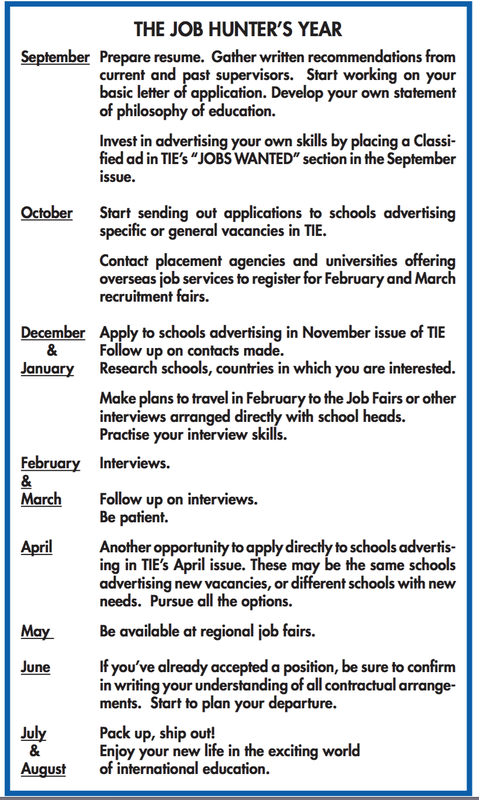 There are later fairs and schools do hire via email. Schools do also hire as late as August so don’t give up. In general do not take a contract where they ask you to come into the country on a tourist visa “because they will get you a work visa when you get there” these schools generally don’t get you a legit visa once you get there. There are exceptions to this so if it happens, do some research to find out if this is normal and legal for this country (Myanmar and Senegal are like this for example). Some advice from my principal is, do not go up to a job fair table or send an email saying “I am a 3rd grade teacher”. Say instead, “I can teach lower school”. That means that you haven’t pigeon-holed yourself into a grade and are willing to try others. Be prepared to teach anything. International Schools are like private schools in that you generally need a teaching license, but you can usually be asked or allowed to teach outside of the scope of that license. For example, my Tennessee License is PK – Grade 3 but I taught Grade 5 for four years. You will need to write a cover letter and a philosophy (one paragraph) that include something about being open to new cultures and experiences. You should consider creating a video of yourself as a sort of cover letter. It is also a good idea to prepare a video of you teaching, but remember your student’s privacy. You should also consider creating a “get me a job” website. As far as dependents: I have heard that there are countries that will not allow you to come in if you are a single parent with a child, especially a woman. But these are mostly the middle eastern countries. There are places where they give you housing and it might be shared so that would be affected. There are schools who will arrange for non-teaching spouses to get work visas in the countries and some that will not. Since I do not have dependents this is a whole area that I know very little about. There are schools that will only pay for 1 child per teacher and others that will pay for all teacher children no matter the number. This is all something that you will have to research. Benefits – Money, housing allowances included in the package, standard of living is high (maid, massages daily, cheap shopping on non-western items), cheap travel and no lack of places to see, experiencing a culture that most Americans know very little about. Cons – pollution, major language difficulties at times (though not that difficult), Asia cultures can be unique, far away from home. Benefits – Language is easier, culture is easier, closer to home, great history. Benefits – Money Money Money, usually very good packages (have friends earning over $100,000 as a couple and only spending about $30,000 a year). Good benefits packages. Cons – middle eastern cultural ideas may not mesh with your own, women can have specific difficulty. Hot. Deserts. Websites to look at: International Schools Review, a good site to look at to get reviews of schools, have to read with a grain of salt but from what I have heard they seem to be pretty accurate. It is one you have to pay for but it does give you a good feel, I have honestly not known anyone to go to a school that has loads of bad reviews and not agree with them so it is worth considering. I think schools with one or two doesn’t mean that much, as in that lack of reviews does not indicate a good school, just one that the teachers either don’t know about the site or don’t choose to use it. The Job Hunter’s Year according to The International Educator Online (TIE Online) newspaper.